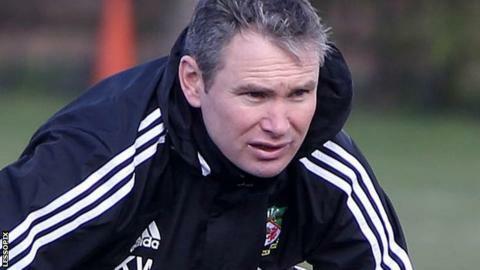 Wrexham manager Kevin Wilkin says he has already identified potential new recruits for next season. The Dragons have three games of the Conference Premier season remaining but Wilkin is already planning ahead to the new campaign. The former Nuneaton boss also confirmed interim talks had begun with some of the club's out of contract players. "There's a fairly long list of players I would like to try and bring to the club," Wilkin said. "There's some players perhaps that are a little unrealistic that will probably require greater financial reward than we can offer. "It's getting the maximum we can from the budget that we're working with. "You look at targets and it's putting that jigsaw together and completing that jigsaw. "It's about working hard, speaking with people and everybody being comfortable with it and where we can go." Only five members of Wrexham's current squad are under contract for next season but Wilkin says he has held preliminary talks with players. "I've had interim talks with people, not all of them," Wilkin added. "It's quite a process and I want to try and be fair to people. "The door's very much open and it will progress as we go through the next couple of weeks." Wrexham travel to Chester in a cross-border derby on Saturday to face a side only one point above the Conference Premier relegation zone. The Welsh side lost 2-0 at home to Chester earlier in the season and Wilkin is well aware of the game's significance to Wrexham fans. "Everybody's aware how much it means to everybody locally," Wilkin said. "Whilst we're safe Chester still need the points to avoid slipping into that pack. "It's nice to have something riding on the game and puts a little bit of edge on the game even at this late stage of the season. "I hope our players go out there and play with the passion and courage that I expect."